Scallion pancakes are a “must-order” for me at any dim sum or Chinese restaurant. I love the crisp outside and fluffy inside. They remind me of a cross between croissants and naan bread seasoned with diced scallions. 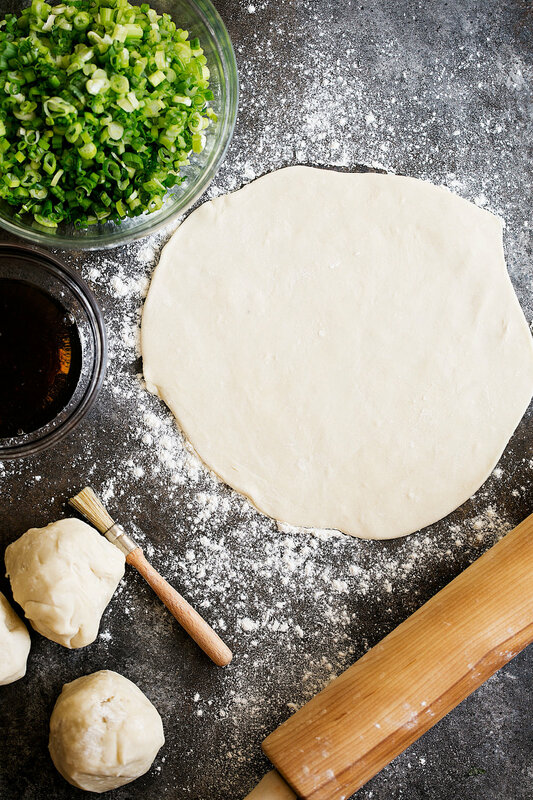 Painting the layers of dough with sesame oil as you roll the dough will yield flakey layers. I have eaten plenty of scallion pancakes but had never tried my hand at making them myself. When it comes to baking I’m always skeptical – even with just a few ingredients baking still seems intimidating to me. And there is not as much room to play around with the recipe as there is with cooking. However, once I finally tried my hand at it, it couldn’t have been easier. I love serving the savory pancakes with a dipping sauce made from equal parts sesame oil and Chinkiang vinegar also known as black vinegar (you can find it at Asian markets or online here). If you are a fan of spicier foods serve with sambal oelek or keep it classic with soy sauce. In the bowl of a stand mixer fitted with a dough hook combine the flour and vegetable shortening. Mix on low speed until the shortening disperses into chunks. With the mixer running, slowly add 1 cup of boiling water and the salt. Continue to mix until a shaggy dough forms. Turn the dough out onto a clean, lightly floured surface. Knead until the dough is smooth, about 3 minutes. Wrap the dough in plastic and let sit for 30 minutes at room temperature or refrigerate overnight. Divide the dough into 4 equal pieces and roll each into a ball. Working one at a time, roll out on a lightly floured surface. The dough should be thin and about 8” in diameter. Brush about 2 teaspoons of sesame oil on the dough and top with about ¼ cup of scallions. Roll the dough away from you (like a jelly roll) into a thin cylinder. Starting at an end, coil the dough into itself, like a cinnamon roll. Cover with plastic wrap and repeat with the remaining dough. Let the dough rest at room temperature for about 15 minutes. Flatten each gently with your hand then re-roll into a thin 8-inch disk. Paint with another layer of sesame oil, sprinkle with another 2 tablespoons of scallions and roll up like a jelly roll again. If the dough becomes too wet, sprinkle with additional flour. Again, twist into a spiral then flatten gently and re-roll into an 8-inch disk. Repeat with the remaining pancakes. In a large nonstick skillet over medium heat, add 2 tablespoons of the vegetable oil and heat through. Working one at a time fry the pancake until golden brown on both sides, about 6 minutes total. Add another 2 tablespoons of vegetable oil and repeat with the remaining pancakes, adding additional oil. Cut each pancake into 6 pieces and serve warm. Makes 4 pancakes, serves 6.